Gillian Thornton paints a picture of Pont-Aven and other attractions in the heart of Cornouaille, southern Brittany. It’s no coincidence that Cornouaille sounds rather like Cornwall – it looks like it too. When 6th century Celts crossed the Channel from England to escape religious persecution, they found a rugged landscape that was strikingly similar to the Cornish countryside of their homeland. In the 1830s, this landscape began to draw the attention of another influential group – painters. By the 1850s, railway lines from Paris were opening up the area to tourists and artists alike, and it was inevitable that the focus of much attention would be Pont-Aven, a vibrant small harbour in the south where the Aven river tumbles down from the hills into a long narrow estuary. A decade on, in the 1860s, American painter Robert Wylie was the first to popularise Pont-Aven as a holiday resort for cosmopolitan artists. But it was Paul Gauguin, arriving here in 1886, who later placed the Pont-Aven School well and truly on the international art map. Gauguin was eager to try out a new concept of representational painting based on the simplification of forms and the application of solid colour – a style that was to become known as Synthetism. He fell in love with the little town and returned five times until 1894, creating many of his most famous works in the countryside around the pretty tidal harbour. 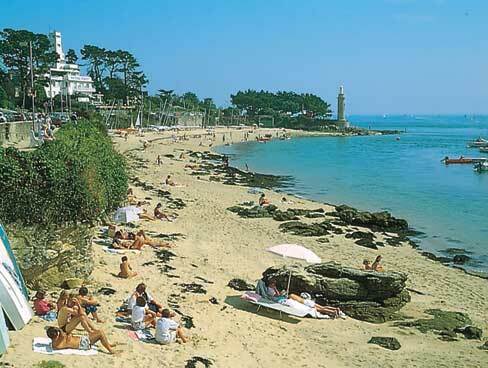 For today’s visitors, there are few nicer ways to approach Pont-Aven than on foot, walking beside the wooded inlets along the estuary from the coastal resort of Port Manech and its small sandy beach and Belle Epoque villas. Ancient timbers of sunken sailing craft protrude from the mud banks at low tide and wading birds strut elegantly along the shoreline in search of lunch. Pont-Aven is a mix of galleries and galettes – delicious rich butter biscuits made locally – but many scenes have changed little since Gauguin’s day. The town museum shows works by the Pont-Aven School, and you can browse and buy from a clutch of independent galleries and admire the many water mills beloved by the 19th-century artists. Paying tribute to this history is the other Pont-Aven – the pride and flagship of the Brittany Ferries fleet. The ship’s interior design includes more than 200 specially-commissioned original works of art – drawings, painting and ceramics – inspired by traditional Breton myths and legends and created to give a flavour of Brittany’s contemporary cultural scene. The Cornouaille region forms the south-west corner of Brittany, in the department of Finistère. It’s an area of sheltered estuaries and hidden harbours, historic towns and ancient customs, many of the latter linked to Britain’s own Celtic roots. But this is more than just Cornwall with a French accent. 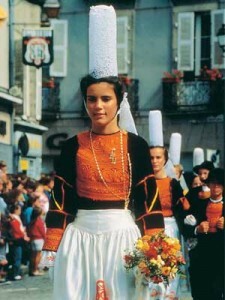 Cornouaille has its own traditions, folklore and even a regional costume, complete with distinctive lace head-dress. Capital of this colourful domain – and of Finistère in fact – is the historic city of Quimper, a name derived from the Breton word kemper, meaning confluence. Here, where the rivers Odet and Steïr run into each other, lived a hermit called Corentin. According to legend he took a piece of fish from a holy well every day, ate a portion and threw it back – only to find the fish whole again the next day. Suitably impressed by this fast-food miracle, King Gradlon of Cornouaille invited the saintly Corentin to become Bishop of Kemper, his capital city, some time around the 6th century. Today, the Cathedral of St-Corentin stands at the heart of a pretty square fringed with half-timbered buildings and pedestrian streets. Before exploring the interior – which is curiously constructed, with a kink in the middle – you can enjoy the view of the twin spires and flying buttresses from a café table. The adjacent Fine Art Museum is home to works by the Pont-Aven painters, as well as Flemish and Italian masters. 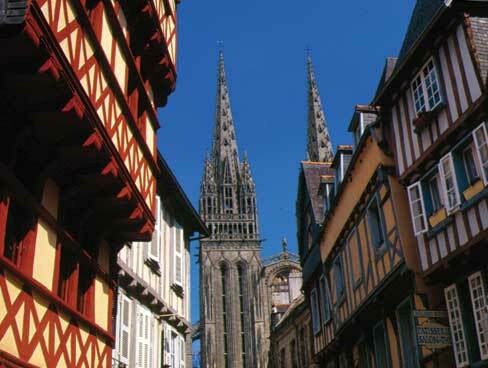 Quimper’s most famous craft tradition is glazed earthenware (faïence), produced in the town since the 17th century. These brightly-coloured hand-painted pieces are inspired by religion, history, nature and the even broader theme of everyday life. 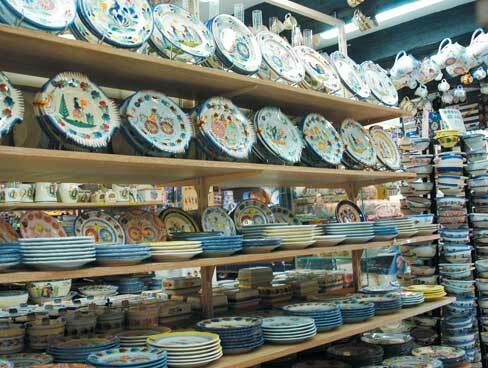 You can visit the Earthernware Museum– Le Musée de la Faïence – and the town’s working factories. Arrive in Quimper between 17th and 25th July and you’ll find yourself caught up in another local tradition – the Festival de Cornouaille. It’s a full-on Celtic extravaganza of music, dance and street entertainment that annually attracts up to 40,000 visitors. 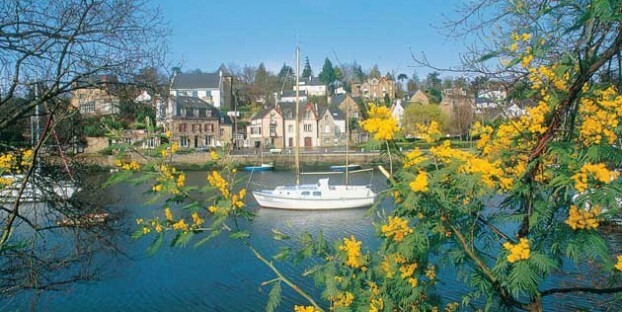 Another treat is to take a cruise from Quimper along the Odet river to Sainte-Marine or Bénodet, which face each other across the mouth of the estuary in a scene reminiscent of Cornwall or South Devon. We were lucky enough to hit Sainte- Marine on July 14th – Bastille Day – when the whole town was preparing for an evening of fun, fireworks and al fresco eating, but it’s a very tempting spot at any time of year. Enjoy a leisurely stroll past the pretty cottages fringing the tiny beach, or along the marina’s pontoons, or install yourself at a quayside café to watch the comings and goings of nautical folk. There’s always something to catch your interest along the Cornouaille coast, be it sleek ocean-going yachts, sailing school dinghies, kite-surfers or fishermen. If you want to drive you can cross from Sainte-Marine to Bénodet via the sweeping span of the Cornouaille Bridge, but there’s more atmosphere to be had on the tiny ferry that carries passengers back and forth across the estuary. Bénodet is a popular family seaside resort and boasts a broad sandy beach, a maritime museum, casino and thalassotherapy centre. If you’ve never felt the therapeutic properties of seawater on tired limbs, you won’t regret booking yourself in for a spa or beauty treatment. As for walkers and ramblers, you really shouldn’t miss the GR34 – a Grande Randonnée long-distance footpath hugging the Brittany coast. It’s well signed and maintained and is a mix of flat shoreline and undulating headland, the scenery ever changing with light and tide. For instance, walk east from Bénodet to the broad sandy beach which sweeps round to the Pointe de Mousterlin, where low tide reveals a vast expanse of rock pools beloved by shellfish collectors, seagulls and of course kids. The nearby Marais Mousterlin is rich in birdlife. A cheeky reed bunting amused us, flying ahead of us in short bursts and stopping periodically to sing loudly from a convenient fence post. Mousterlin looks out over the broad sweep of Concarneau Bay and there are lovely views across the water to Concarneau town from the headland at Beg Meil. 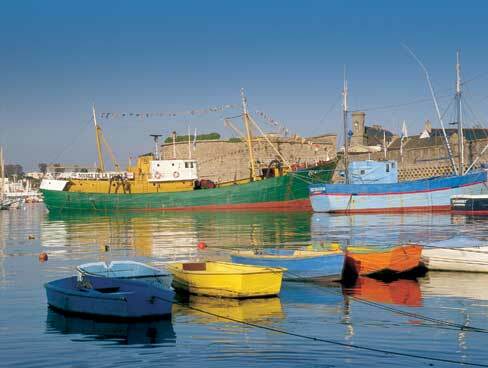 A popular seaside resort, the town was for many years one of the most important fishing ports in France. Another big draw is the fortified medieval Ville-Close (Walled City), the atmospheric old town perched on a rocky island inside the port to guard the harbour. Boat trips take you to places such as the Iles de Glénan, an archipelago of 12 tiny islands about 20km offshore and popular with birdwatchers and scuba-divers. From Concarneau, Pont-Aven is just a short drive away across country, and there’s a lot to be said for making yourself at home at a harbour café in the old painters’ port. 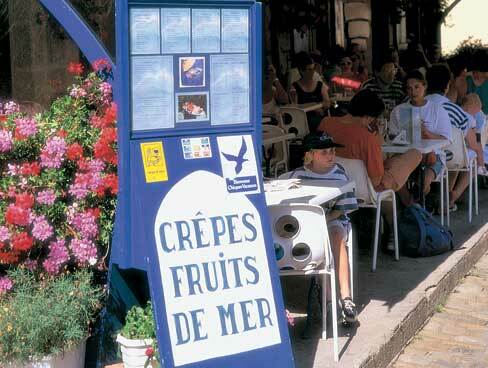 Restored with a bowl of local cider and a sweet or savoury crêpe – the favourite Breton snack – you can watch the world go by and maybe hope for a little artistic inspiration. After all, it worked a treat for Gauguin.